Excellent Development Opportunity in an exclusive Island. 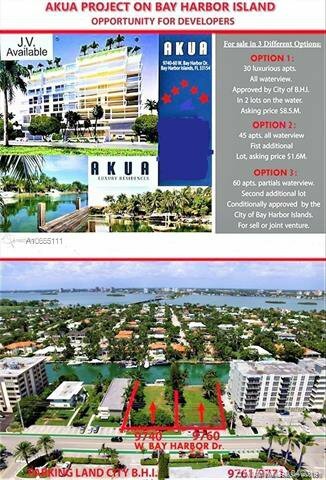 Â· Close Proximity to Bal Harbour Shops, Surfside and Sunny Isles Â· Waterfront Property Surrounded by Luxury Condominiums and Hotels Â· Walking distance from the Atlantic Ocean , Synagogue and Church. High End Dining and Shopping Options . Sale includes 2 different folios 1322270010720 and 1322270010730 for option 1. Total of 22,500 SF. Equal Housing Opportunity. Listing courtesy of Grand Realty of America, Corp..